At least that's what Jeaniene Frost wants us to believe. "If I felt nothing more for you than lust, Maximus would be on that pole for a week, and you, my lovely interloper, would not be here with me now. "Hardly the words you'd find on a Hallmark card, but they caused a glow of happiness nonetheless.3.5 stars. Okay, so I might be exaggerating just a little. Vlad Tepesh (a.k.a. the Dracula) was still up to his pole-impaling ways, although he didn't come off nearly as menacing as the legend portrays. Sure, he gets pissy and makes an example of people, but he also has a protective side when it comes to what he deems "his" people. Strange? Yeah...kinda.It's Vlad though. We already know him from Night Huntress. He's temperamental; he's arrogant; he's the only vampire you even want to read about anymore. So what if he's not quite as threatening as how we (or maybe just I) envisioned THE Vlad...I'd still be afraid of him though. Authentic or not, he's still a scary badass.Even though this book didn't give me the same feel-good reaction that I had the first time I ever picked up a NH book, I still found Once Burned to meet and exceed my expectations. After finding myself starting to lose steam with the NH series (I still haven't read book 6 after being extremely disappointed with book 5), at least this book felt like we were heading into some new territory.The first half of the book was a lot of fun. Talk about starting off with a bang. The carnie vibe and new "cool" powers introduced in this book made me glad that I wasn't reading a rehash of Cat and Bones (who went from exciting to snoozeville). One of my favorite things about UF/PNR is getting to suspend belief. So what if an electric shock isn't going to turn someone superhuman? In paranormal books anything is possible. Woo hoo!The second half of the book made me nervous. Frost has a way of creating great characters and drawing you into a world extremely fast. Then the story starts to flounder somewhere. It wasn't that the second half of the book was boring (okay, maybe a couple of chapters were...eh, that's minor though) but I was already starting to feel like I was ready to be done with the story once Vlad and Leila hooked up. I'm not sure how I'm going to handle an entire series. 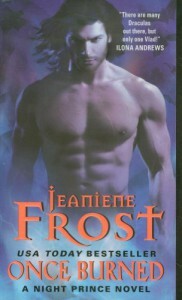 The first time I read a Frost book, I appreciated this author's mashup of UF and PNR....until after 3 books of NH, I realized that the format doesn't work for sustaining interest. I prefer either a single book/single couple PNR or a slow build UF romance with ongoing story. There is something about putting a couple together and having them continue their story over several books that smacks of domesticity, even if conflicts pull them apart and they have to find their way back together. You never get that initial spark back. The fantasy dies.Maybe I'll get lucky and this won't happen. But I'm seriously doubting it.Extra random thoughts...~ Leila's sister reminded me of a rehash of Cat's mom. I was ready to kick her out the second she showed up.~ Loins was used 10 times in this book. Who uses that term outside of historicals? Why don't I remember seeing this in NH? Was it there too?~ Don't misunderstand this review. I'm definitely looking forward to book 2.